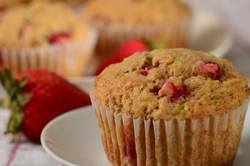 When you have fresh strawberries on hand and ripe bananas sitting on the counter, try these Strawberry Banana Muffins. They make a nice change from a regular banana muffin, and while you may think this is an unusual combination, bananas and strawberries, these two sweet fruits really go well together. Muffins belong to the 'quick bread' family and these Strawberry Banana Muffins are quick to make. Just two bowls are needed; one for the wet ingredients and one for the dry. Combine the two ingredients together, using a light hand, and your batter is made. One tip I have found to make life easier is to use an ice cream scoop for transferring the batter to the muffin tins. And while you can place paper liners in each muffin cup I often just give the pan a quick spray with a nonstick vegetable spray (can also grease with butter). If you want giant sized muffins then this batter will make six. Otherwise you will get 12 regular sized muffins. Just remember that if making giant muffins you will have to increase the baking time by at least 5 minutes. They are done when a toothpick inserted into the center of the muffin comes out clean. For times when you have overripe bananas and don't want to bake with them right away, you can freeze them whole (in their peels), wrapped airtight, for up to 6 months. Or you can peel and mash them, stir in 1 teaspoon lemon juice for each banana, and freeze in an airtight container or bag. Then you are ready to make banana muffins anytime. Strawberry Banana Muffins: Preheat oven to 350 degrees F (177 degrees C). Place the oven rack in the center of the oven. Line a 12 cup muffin pan with paper liners or lightly butter or spray the muffin cups with a vegetable spray. In a small saucepan melt the butter. Let cool to room temperature. In a medium sized bowl whisk together the eggs, vanilla extract and mashed banana. Add the melted butter and stir to combine. In another large bowl combine the flour, sugar, baking powder, baking soda, cinnamon, and salt. Gently fold in the berries, making sure they are coated with flour. (This helps to prevent the berries from sinking during baking.) Add the wet ingredients to the dry ingredients and stir only until the ingredients are just combined. Do not over mix the batter or tough muffins will result. Divide the batter evenly among the 12 muffin cups, using two spoons or an ice cream scoop. Place in the oven and bake until a tester inserted in the center of a muffin comes out clean, about 20 to 25 minutes. Transfer to a wire rack to cool. Can be stored for a few days at room temperature. Makes 12 regular sized muffins. Preparation time: 20 minutes. Brooks, Karen. Oregon's Cuisine of the Rain. Addison Wesley Publishing Company. 1993.